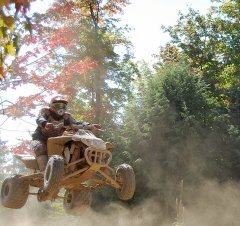 Allegheny National Forest has more than 100 miles of ATV trails. The riding season runs from the Friday before Memorial Day through the last Sunday in September, winter season is from December 20 to April 1. An annual $35 permit is required, which can be submitted with this application. Marienville ATV/Bike Trail on State Route 66 east of the town of Marienville. Timberline ATV Trail, accessed from State Route 948, north of Ridgway (also connects to the Marienville ATV Trail). Rocky Gap ATV Trail, accessed from Township Road 3005, southeast of Warren. Willow Creek ATV Trail on the eastern side of the Allegheny Reservoir, just south of the New York State line. Closed during the winter season. Enjoy ATV, Dirt Bike, and Motorcross riding year ’round. Two loop trails with hill climbs, curves, and mud total over 38 miles, and are located on nearly 940 acres. Day or Annual Trail Fees. A motorcross play area is available along with primitive camping. Trails have two riding levels-intermediate and expert. Located east of Bradford, Pennsylvania, along Route 46 in Rew. Call 814-465-9979 for more information. Many other ATV riding opportunities exist across the Forest region on public and private lands. Contact the Allegheny National Forest Visitors Bureau at 800-473-9370 for more information.